BURNABY, B.C. - A Canadian Pacific Railway train operated by a CN Rail crew derailed in Burnaby, B.C., sending seven cars off the tracks and spilling coal into a creek that feeds into a lake. She said she also did not know whether CP or CN, which owns the tracks, is responsible for the derailment of the train with a total of 152 cars. "The incident is under investigation at this time," she said. "CN and CP are on site, and environmental crews have been mobilized to assess the impact and implement an appropriate response plan." He said the metallurgical coal, used in steelmaking, was destined for Neptune Bulk Terminals in North Vancouver and was from mines in B.C. 's Kootenay region. 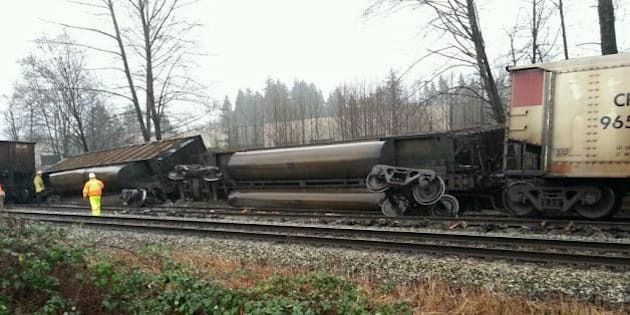 Transport Canada and the provincial Environment Ministry are investigating the cause of the derailment, which Burnaby RCMP Staff Sgt. Wayne Baier said damaged some of the other cars but did not result in any injuries. Kevin Washbrook, spokesman for a group called Voters Taking Action on Climate Change, said he saw powdered coal leaching into the creek from two overturned cars. The creek had turned black and nearby signage indicated it's a sensitive fish habitat, he said. The derailment is a wake-up call to hold back on proposed plans to increase coal export capacity at Neptune Terminals, Washbrook said. He said that if the Vancouver Fraser Port Authority's plan is approved, coal exports would triple at Neptune in North Vancouver, where city council has called on the authority to conduct a comprehensive health assessment before the expansion. "The port authority has complete decision-making power over port lands but those decisions have potential impacts for surrounding communities," Washbrook said. "We've spent a year and a half now on this issue, encouraging the federal government to step in and their response has always been, `Talk to the port authority.' When we raise issues with the port authority about this they say, `It's up to the railways to control the movement of trains.'" The company has said 17 of the train's 122 cars derailed, and some of them were carrying crude oil and propane. Note to readers: This is a corrected story. A previous version reported a CN train derailed.